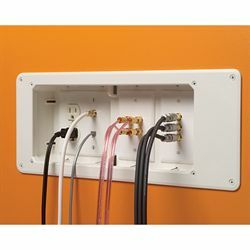 This 13-inch-wide recessed outlet box makes it easy to put a flat display flush against the wall by providing recessed sockets for your single-gang duplex outlets. Plugs and connections stay behind the wall's surface, so you really can flush-mount a TV. Install two duplex power receptacles or use the box separator to install one low voltage device and one power duplex receptacle. Two additional built-in mounts are provided for low voltage, data/media connections, satellite TV or speakers. Includes low voltage separator, NM cable connector, eight #8 x 1.5" screws and trim plate. Wiring devices and outlet panels not included.